Barry applies Goal Play! to baseball and leadership | Goal Play! It is always a pleasure to attend the Institute for Healthcare Improvement’s annual forum, and I was fortunate to meet some great folks there. One is Barry Lyons, a pharmacist from Saskatchewan. Here you see him and me at the bookstore, holding one of our favorite books! 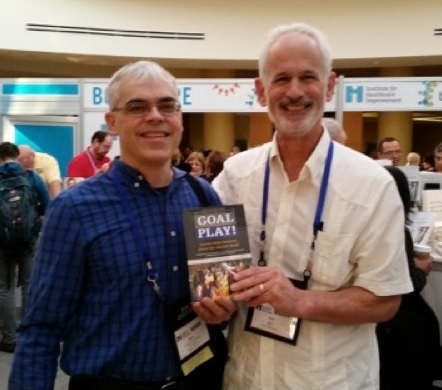 “We met briefly at the IHI conference in December, and I just came across your business card today, and remembered that I had said that I would share my presentation about leadership in pharmacy, using my experience as a baseball coach, modeled on your book. Check it out. I think he does a really fine job with the topic.